Land Shark!! : Yea # 20!!!! Congrats to Tony Stewart!!!! 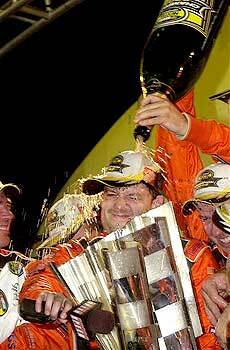 The 2005 Nextel Cup Champion!!! Tony didn't have a great race at Homestead today, but he held on enough to take the championship win. I am so happy for Tony. I know this win meant so much to him. The Home Depot Team had a great run this year and helped give Tony the momentum that he needed. On another note... The Steelers didn't get it done today. They were horrible against the Ravens. But that's ok, cause GO TONY!!!!!! Yea # 20! !